A couple of weeks ago I discovered that it was easy to shoot photos through my microscope by just jamming my cell phone camera up against the eyepiece, so I started looking for interesting things to shoot. 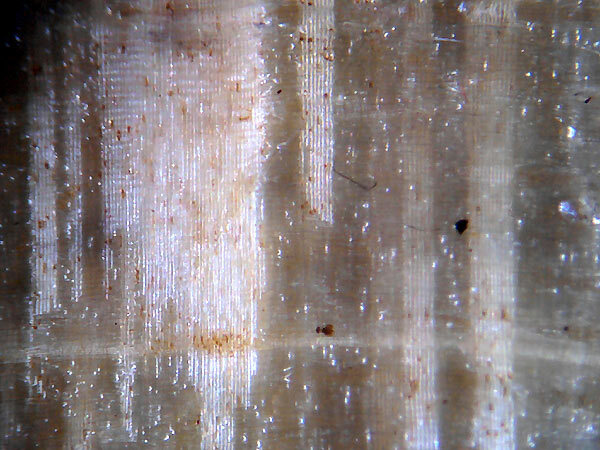 Some of the varnish ground samples on bridges, shown in an earlier post, look pretty cool under the ‘scope. In this shot, the big vertical comb towards the left is one ray (the vertical spotting) on a violin bridge, which in the tree is a radial bundle of cells running horizontally out from the middle of the tree. The horizontal line on the bottom is a grain line running horizontally across the bridge face (remember, a bridge is turned 90 degrees from the way a tree grows). The two smaller rays on the right are deeper in the wood, and the sealer I’m testing on this sample let me see right down into the wood for a short distance to see them. 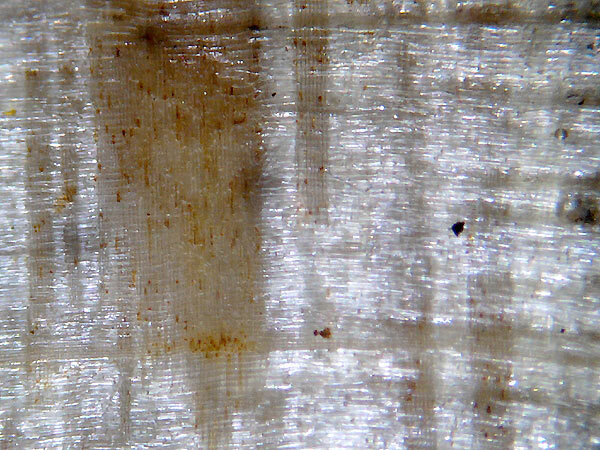 There is horizontal wood structure not visible here because of the lighting–the lengthwise fibers in the tree, since this photo is turned 90 degrees. You can just barely see them, as fibers running parallel to the grain line, on the far left. 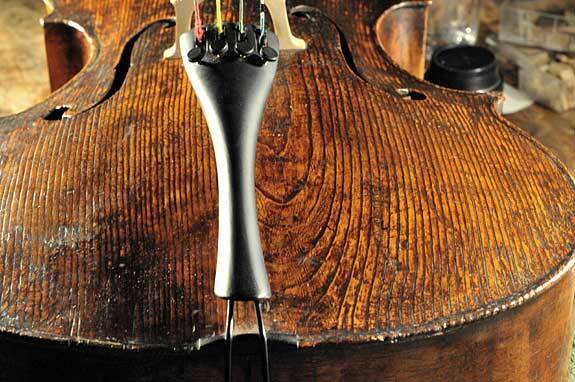 This violin is not even 100 years old, even though it looks 300. It came to me with several open cracks on the top, and as soon as I glued one, the stress of closing that gap opened up another. The toasty-brown color and the smell show that the wood was treated with nitric acid to darken it, and the result of this is that the structural strength of the wood has been seriously compromised. 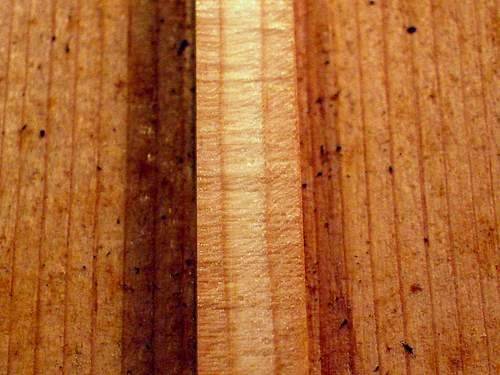 For over 100 years, treating wood with nitric acid to make it look old was a common practice of some French makers. 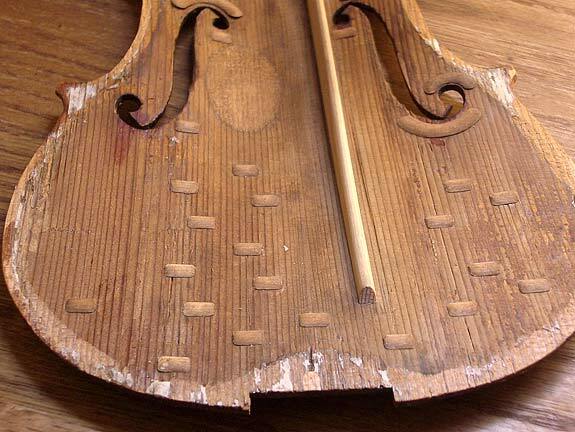 Usually the results aren’t this severe, but I did once work on a cello that’s exactly as old as I am, but in much worse condition. Violin lore says that J.B. Vuillaume ruined some of his instruments by baking them. I’ve never seen a Vuillaume I thought was baked, but have seen several I thought had been treated with nitric acid, which has a definitely-different look from baking. It makes sense that this would have been what he did, since the idea of using nitric acid to darken wood probably came from bow makers, who still it to darken pernambuco without any undesirable effects. Modern makers think they need the very best wood, with particular grain widths, specific gravity, ideal species, from the right side of the mountain cut at the right time by the right person saying the right incantations. The old Italian makers weren’t so fussy. This ¾-size cello is from around 1780, and it sounds great. Go figure.